Egypt’s New Government Promotes Anti-Christian Measures? In a televised speech delivered a few days ago, Mansour addressed the Copts in a very inclusive way, one much welcomed and appreciated by Egypt’s Christians. Among other things, he indicated that they were equal citizens, “brothers” to the Muslims; that they have been an integral part of Egypt’s history; that both Copts and Muslims are victims of and enemies to “terrorism” (a reference to the Brotherhood and other Islamist organizations). I speak to you [Copts] today through the true spirit of Islam—the spirit whose values appeared in the Pact of Omar, wherein the righteous Caliph, Omar bin al-Khattab, made a covenant with the Christians of Jerusalem, after Medina opened [conquered] it in the year 638; the Pact which preserved for the Christians their churches, monasteries, and crosses, and their religion and possessions. Egypt again renews the spirit of this pact and its principles with you; Egypt, the Muslim state, which takes from the values and principles of the tolerant and true Islamic Sharia for its legislation. To those familiar with the actual text of the Pact of Omar—also known as the shurut, or “the conditions,” of Omar—the above speech is a strange contradiction. After all, whereas Koran 9:29 provides divine sanction to fight the “People of the Book” (namely, Christians and Jews) “until they pay the jizya [monetary tribute] with willing submission and feel themselves subdued,” the Conditions of Omar lay out in detail how Christians are to feel themselves subdued. We guarantee all this to you upon ourselves, our descendants, our spouses, and our neighbors, and if we change or contradict these conditions imposed upon ourselves in order to receive safety, we forfeit our dhimma [protection], and we become liable to the same treatment you inflict upon the people who resist and cause sedition. 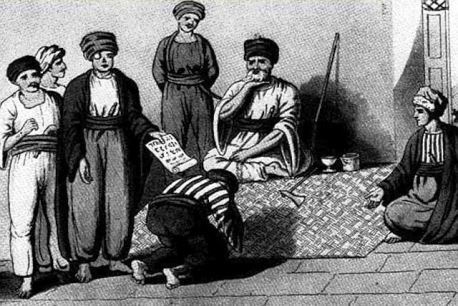 To “become liable to the same treatment you inflict upon the people who resist and cause sedition” simply meant that, if any stipulation of the Conditions was broken, the Christians would resume their natural status as non-submitting infidels who “resist and cause sedition” against Islam—becoming, once again, free game for killing or enslavement. It [ISIS’ statement] says Christians must not make renovations to churches, display crosses or other religious symbols outside churches, ring church bells or pray in public. Christians must not carry arms, and must follow other rules imposed by ISIS on their daily lives. The statement said the group had met Christian representatives and offered them three choices—they could convert to Islam, accept ISIS’ conditions [based on Conditions of Omar], or reject their control and risk being killed. “If they reject, they are subject to being legitimate targets, and nothing will remain between them and ISIS other than the sword,” the statement said. If the infidels live among the Muslims, in accordance with the conditions set out by the Prophet—there is nothing wrong with it provided they pay Jizya to the Islamic treasury. Other conditions [reference to Conditions of Omar] are … that they do not renovate a church or a monastery, do not rebuild ones that were destroyed, that they feed for three days any Muslim who passes by their homes … that they rise when a Muslim wishes to sit, that they do not imitate Muslims in dress and speech, nor ride horses, nor own swords, nor arm themselves with any kind of weapon; that they do not sell wine, do not show the cross, do not ring church bells, do not raise their voices during prayer, that they shave their hair in front so as to make them easily identifiable, do not incite anyone against the Muslims, and do not strike a Muslim…. If they violate these conditions, they have no protection. What, then, do we make of Mansour’s reference to these medieval Conditions—in a speech meant to reassure Egypt’s Christians of their equality as citizens of a modern nation? 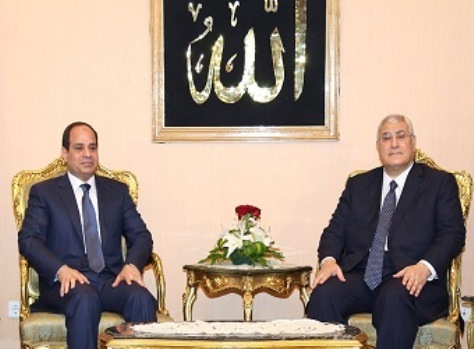 What do we make of the fact that Mansour’s views on the Copts—often seen as inclusive and moderate—are shared by Sisi, Egypt’s new president, who is believed to be more of a pious Muslim than his predecessor? Was Mansour employing a bit of Islamic tawriya, mentioning seemingly tolerant aspects of the Conditions—that Christians are allowed to “preserve” their existing churches, monasteries, and crosses—while ignoring the “conditions” Christians must obey in exchange for such “tolerance,” namely, that they not build new or repair old churches and monasteries and to keep their crosses out of sight—otherwise they lose all “protection”? Through such double-talk, was Mansour trying to placate, on the one hand, the Copts, many of whom do not know much about the Conditions, and, on the other, hardline Salafis who do—with words and references that convey different notions to different people? Indeed, from a Salafi point of view, Mansour’s declaration to the Copts that “Egypt again renews the spirit of this pact [Conditions] and its principles with you; Egypt, the Muslim state,” is tantamount to telling the Copts to remember their place in a medieval Muslim society and embrace their lot as dhimmis, third-class citizens. Nor does Mansour’s use of abstracts like “the spirit” or “values and principles” (of the Conditions) lessen the significance of his words. For however one spins it, the only meaning of the Conditions is that Christians—because they are Christian, not Muslim—must uphold discriminatory and humiliating conditions in order to experience tolerance in an Islamic state. Then again, could Mansour himself, a judge and former head of Egypt’s Supreme Constitutional Court, be ignorant or incredulous of the truth concerning the Conditions? This is the fundamental problem facing all moderate Muslims: despite what they like to believe and due to a variety of historical and epistemological factors, they are heavily influenced by Western thinking … so whenever they come up against Islamic teachings they cannot fathom [such as the discriminatory Conditions], they collectively behave as if such teachings don’t really mean what they mean. Yet the Salafis know exactly what they mean. At any rate, despite Mansour’s disturbing references to a medieval text that historically justified Christian subjugation, most Copts believe that Egypt’s government, first under Mansour and now Sisi, is preferable to Morsi and the Muslim Brotherhood. And most remain optimistic about Sisi. Time will tell if such optimism is warranted, or if Egypt’s Christians will again be fated to watch their nation take one step forward only to take another one right back—the inevitable outcome of a worldview that always tries to articulate itself through Islamic terms.